Okay, so maybe I rarely look at a piece of furniture as a work of art or a work of art as a piece of furniture, but after walking into Clayton Thompsons’ Ivory Bill Workshop, I became aware it is possible. Smooth curves, rich hues and woodsy aromas could easily describe either a painting, a sculpture or a handcrafted chair or table, so what is it really? Art or furniture? According to Clayton Thompson, it is both. 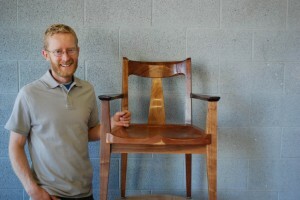 Clayton started designing and producing furniture after he graduated from the Academy of Art school in San Francisco and after his first job working in a cabinet shop, he quickly realized his calling. And just like the company name, which was once thought to be an extinct bird, Ivory Bill Workshop has brought back the lost art of furniture making.